Recently, Greg Ip at The Wall Street Journal wrote an article warning that a corporate tax rate cut might not deliver the growth promised by the White House. For the most part, Greg is correct: a corporate rate cut alone does not guarantee the degree of economic growth the White House may be assuming. However, there is a deeper story here. First, the statutory rate is not the only factor that determines a corporation’s tax burden. Many countries incentivize investment in their economies by providing tax credits, deductions, and exemptions. These additional tax provisions change the effective tax rate on business income. In particular, capital cost recovery (depreciation) allowances have a particularly strong effect on the tax burden on business investment. By increasing or decreasing the time over which a capital investment can be deducted, the value of the deduction stream (net present value or NPV) also changes. If depreciation lives are lengthened, the NPV of the deductions decreases, and a greater portion of the capital purchase is taxed, which increases the tax burden on the capital investment. This is a problem because, when the deductions are strung out over time, businesses end up paying taxes on part of their costs, as well as their profits. If depreciation lives are shortened, the cost of investment is more fully eliminated from the tax base. Best of all is if investment is immediately expensed in full. Then the whole cost is recognized for tax purposes, which effectively eliminates the taxes on normal returns. To capture the effect of capital allowances, many academics have moved away from simple statutory rates to effective marginal tax rates (EMTR), which adjusts for differences in capital allowances. 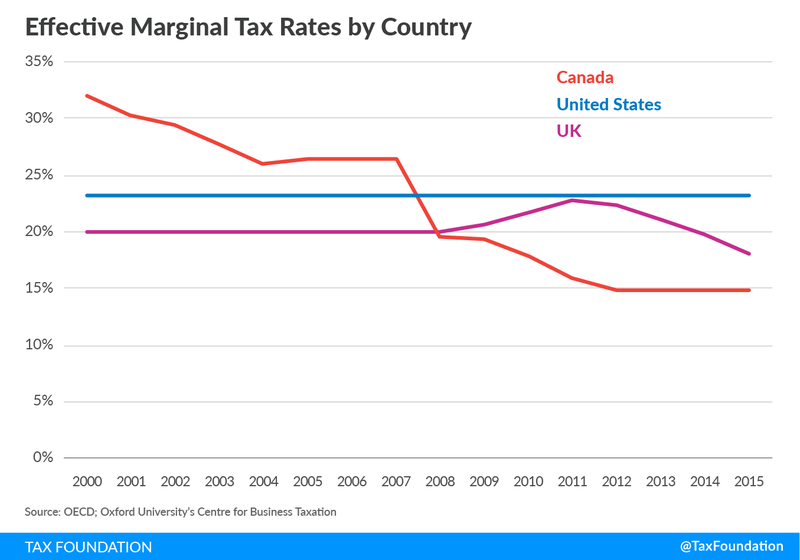 When the EMTR for Canada, the UK, and the U.S. are charted over the same period as the graphs in Greg Ip’s article, it is obvious that the UK’s corporate tax did not fall over that period. In fact, the effective corporate tax rate increased from 2008 to 2011 even as the statutory rates were falling. The EMTR in the UK increased because the UK lengthened the period over which capital investments could be deducted to raise tax revenue to pay for cutting the corporate tax rate. Depreciation lives of machinery were lengthened, and the deduction for buildings was eliminated entirely! These steps reduced the NPV of the deductions immediately, and since the corporate rate cuts were phased in over time, and were not deep enough to offset the ill effects of the longer asset lives, the net effect was an increase in the actual tax burden on investment for corporations in the UK. In Canada, by contrast, the tax reforms of 2007 increased (speeded up) capital allowances for nonresidential buildings and many classes of equipment while simultaneously reducing the corporate tax rate. The combination of these two pro-investment changes led to a sharp drop in the actual tax burden on corporations in Canada. Over the same period, the U.S. had no significant, permanent reform, which kept its EMTR the same. The three countries experienced three different scenarios from 2000 to 2015: an increasing tax burden in the UK, a decreasing tax burden in Canada, and an unchanged tax burden in the U.S. But other factors were also affecting the growth rate of the nations over this period. The second issue, then, is that economic growth in a global marketplace depends on the growth of other economies. Growth in one country is often correlated with growth in another. For this reason, one should be wary of simple correlations between economic growth rates and a single factor affecting it. 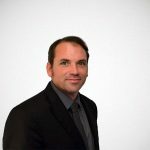 There are other indicators of economic development, which are less susceptible to fluctuations in world markets and more closely related to capital formation. The average wage growth is an alternative metric for describing the economic health of a country. An increase in the average wage suggests that productivity is growing, and businesses are expanding operations and seeking qualified personnel. However, businesses are cautious about hiring full-time personnel if the economic outlook is uncertain. Therefore, the average wage tends to increase with economic growth, but is less sensitive to short-term market fluctuations. 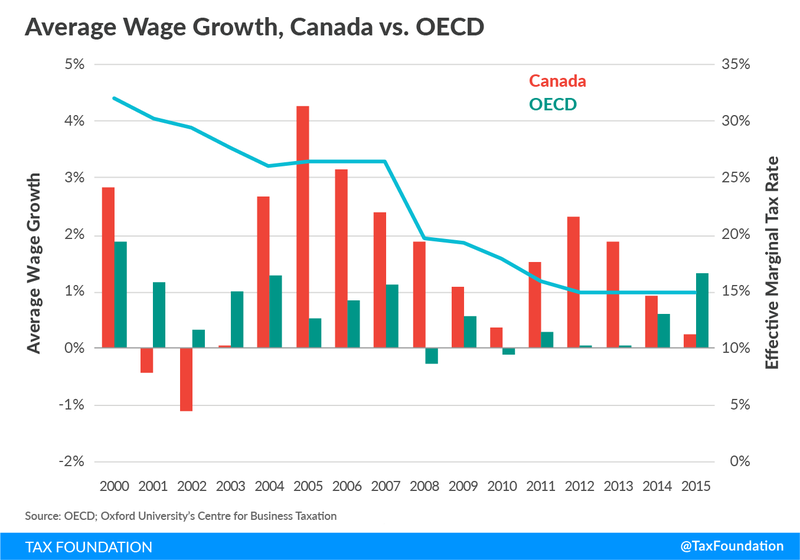 Utilizing the OECD average wage growth as a baseline, I compared the three countries over the period from 2000 to 2015 that Greg Ip presented in his article. Over the 15-year period, Canada’s effective marginal rate was generally falling. At the same time, Canada’s average wage grew significantly faster than the average wage across the OECD. Conversely, the UK’s EMTR was unchanged until their tax reform in 2007. From 2000 to 2007, the average wage growth was above that of the OECD. After the 2007 tax reforms, the EMTR increased due to a change in capital allowances. 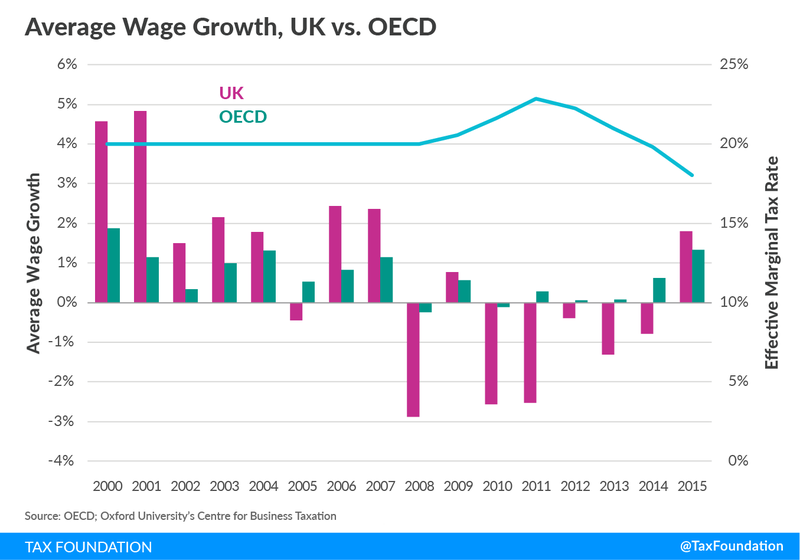 As the EMTR increased, the UK began to experience negative average wage growth, even as the OECD had positive average wage growth over the same period. 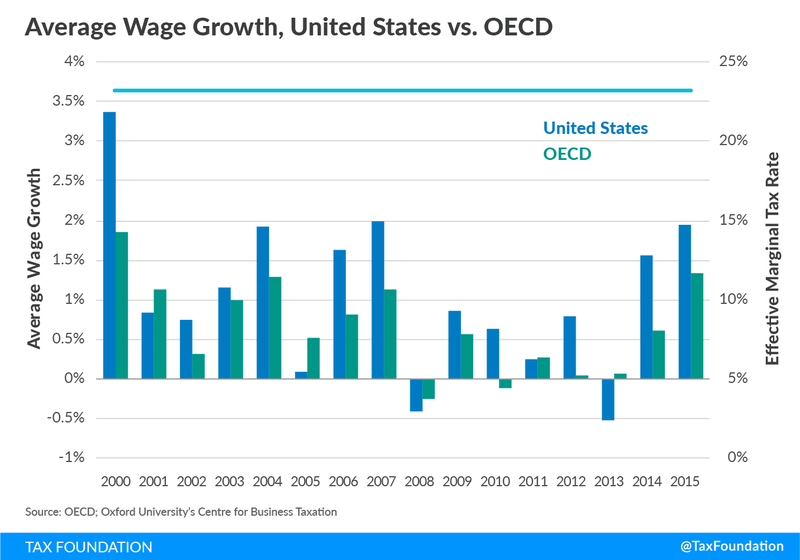 By comparison, the United States’ EMTR did not change significantly over the 15-year period, and the average wage growth in the United Sates was similar to the average wage growth of the OECD. The average wage is not a perfect metric for economic growth. The level of the wage has other influences, and determining which influence affects the wage is difficult. This illustrates the point: none of the available metrics for economic growth are perfect. The average wage has problems just as much as the percent change in GDP has problems. For this reason, Andrei Shleifer’s and Kevin Hassett’s studies mentioned by Greg Ip analyzed very specific economic situations where the economic effect from a tax policy change could be separated from other economic influences. Countries that are integrated into the world economy are part of a complex web of production and consumption, which is difficult to unwind. As such, the effects of tax policy on economic growth is sometimes elusive, especially when other factors are changing dramatically in a world economy, as with the great recession following the housing shock. The relationship is often clearer in more closed economies during less economically turbulent periods, as in the years immediately following the Kennedy tax cuts. One final conceptual note is key to understanding the relationship between taxes and growth. The effect of a tax change on the growth rate is likely only temporary. Reducing the taxes on capital formation will make it possible for the economy to create and maintain more capital. As the new capital is formed, the economy may grow faster for a period. Once the new level of capital is achieved, growth should resume at a more normal pace. A similar, though more muted, effect occurs when the marginal tax rates on labor move up or down. Economic theory from the time of Adam Smith has shown that taxes stifle the incentive for individuals to work, take risks, and buy and sell goods and services. Rather than revisiting whether taxes affect economic behavior, research should focus on quantifying the tax burden on businesses and individuals, and the extent to which each type of tax affects economic incentives. Policymakers would be better served by research that helps them understand the trade-offs between different tax policies than by casual correlation exercises seeking to disprove fundamental principles of economics.